For the opening game stadium the World Cup is over. Starting Thursday, capacity of the stadium will be down to 48,000, while dismantling of the temporary stands should last until November. Wednesday’s semifinal between Argentina and the Netherlands ended Arena Corinthians’ participation in the 2014 World Cup. 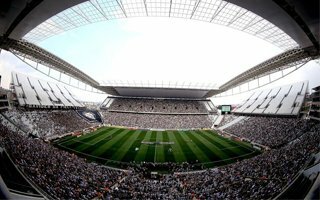 Already on Thursday, Jul 17, Corinthians will return to regular operation of their new stadium with a Serie A fixture against Internacional. To make the stadium ready as soon as possible, Fast Engenharia (the company responsible for setting up temporary stands) began dismantling of several dozen of seats that will no longer be used. Yesterday preparatory works were launched with the removal of electric installations inside all temporary sections. Two large terraces in the north and south along with two sections in the east were planned to raise capacity over the 65,000 mark with their 19,800 temporary seats. In the end the stadium’s size was cut back to just over 63,000. Now, as the 120-day long operation began, capacity is back down to around 48,000, which will be the stadium’s final size. All of the temporary stands are sealed-off ahead of Thursday’s game, as they won’t be used any more, even if still existing over the next few weeks. The dispute between public authorities and Corinthians over who will cover the construction/dismantling cost was a very long one, leading partly to the delays that led to last section of temporary seating receiving safety approval 4 days before opening game. The stadium has been known for safety infractions in months preceding its inauguration. In November two workers were killed when a giant crane collapsed onto the north-eastern corner of the stadium. Then in March this year one more worker died as he fell from the temporary stand. Overall 26 serious safety breaches were listed as the construction site was audited.